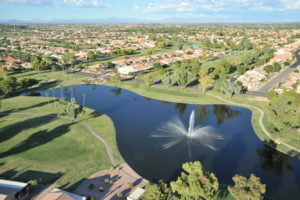 Active Adult Retirement Communities Near Phoenix, AZ await! You are ready to move to a warmer climate, but how do you find the best homes for sale in Sun Lakes, AZ? There are many, active adult retirement communities near Phoenix, AZ to choose from so here are a few tips to help you in your search. This may seem like an easy task, but with so many active adult retirement communities near Phoenix, AZ, with so many different amenities, activities, views, etc., it can be a little overwhelming. To start your home search, think about the location and how much space you’ll want, the types of rooms and views you’d like to see outside of your windows, and all of your other desires. Then, create a wish list. This way, you’ll have a better understanding of what you want… and need… before contacting a real estate agent. Each community offers unique and various amenities, activities, views, and more. Whether you want to golf, swim, play cards, or just relax at home, there are many choices! 3. Hire the right Sun Lakes – Chandler realtor. To get the home of your dreams, this is a very important step. Any real estate agent can let you know what’s available and show you different homes. But a Sun Lakes Chandler realtor will know the area well (here at The Kolb Team, we live in Sun Lakes, AZ! ), have extensive experience, learn about your likes and dislikes in a potential new home, walk you through the buying process as quickly and easily as possible, and much more. In addition to online research, also check with family, friends, business associates, and more for great referrals to a Sun Lakes – Chandler realtor. Take the time to find the right person to help you. This can make the difference between owning your dream home fast or being disappointed and losing out on a great house that you really wanted. The Best Homes for Sale in Sun Lakes AZ Await! There are many, fantastic home available in the active adult retirement communities near Phoenix, AZ. To find just the right one for you, make a list of exactly what you want and conduct some research. Look at all of the various home styles, exclusive amenities, activities, and more. Then, check for a Sun Lakes Chandler realtor who lives in the area and has the experience you need to obtain your dream home. Buying a home can be stressful. But if you know what you want and have a skilled expert helping you, it can be a fun and enjoyable experience. Are you ready to see the homes for sale in Sun Lakes AZ right now? Click here to start your search for active adult communities near Phoenix, AZ.